If you all remember my resolution from a recent Top Ten Tuesday, I resolved to read as many of the Youth Media Award winners as I could. Now is the time to put that plan into action. As you may know, the awards were announced last Monday morning, to my great pleasure. Today, the Best Fiction for Young Adults, Amazing Audiobooks for Young Adults, and Great Graphic Novels for Teens lists were all released, as well as a few others, some already released and others to be released soon. What am I getting at? 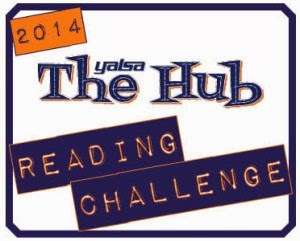 The 2014 YALSA Hub Reading Challenge. Oh, and if that's not enough motivation for you all to jump in, there's more. Those of us who complete the challenge will be entered into a pretty awesome drawing to win a tote bag full of 2013 and 2014 teen lit titles. AND you get virtual badges along the way! For bragging rights, of course. Will you be participating in this challenge? Are there any other challenges you're working on this year? I read a lot but I get a little fuzzy on keeping track of challenges. Goodreads pretty much tallies them for me, so I've got that down! I tend to use these types of challenges to add books to my TBR but then read them at my own pace. Whatever gets the word out about worthwhile books, I can get behind! You know what? I think I'll give this a go! This sounds like a challenge that is interesting and worthy. I may give it a try myself!